Henry Montoya Mendez - Reef keepers in Focus! In this personal profile, we are going to talk to Henry Montoya Mendez from Nicaragua about the challenges of keeping a reef aquarium in a country where the hobby is very poorly developed and where it is hard to find even basic marine equipment. My name is Henry Montoya Mendez but everyone calls me many. I live in Managua. (The capital of Nicaragua) and I have been keeping saltwater fish for more than 20 years. For a long time I kept fish only aquariums but about 5 years ago I got a job answering calls to the Spanish support line for a large binary options broker in the USA and I started earning enough money to realize my dream. To set up a reef aquarium. It has been a fascinating journey with a lot of hardship along the way but I am happy that I got the chance to keep one. What was the first fish you kept? I honestly do not know. The first fish I ever kept was fish that I had caught myself in small tidal pools on the Pacific coast. Back then I did not have the knowledge or access to the information to identify them. The Internet has really changed that. If I had to guess from memory, I would say that I most likely kept damsels and a blenny. Hardy species that could survive in tiny tidal pools. I kept them in a small homemade glass aquarium with a few rocks and no filter. The fish survived in there for a few months, but after that, I lost them. Losing them made me want to learn more about fish keeping, and I was able to get a hold of an old book that I must have read a thousand times. I kept catching fish in tidepools and rivers. I slowly learned how to keep them successfully. I remember that when I was about 12, I was able to breed rainbow cichlids. Doing so is very easy but it was a big day for me, and it made me want to learn more. I Started keeping more and more freshwater fish and kept a large number of native cichlids as well as freshwater angelfish. It was tough to get ahold of foreign species. How come that you stopped keeping cichlids? 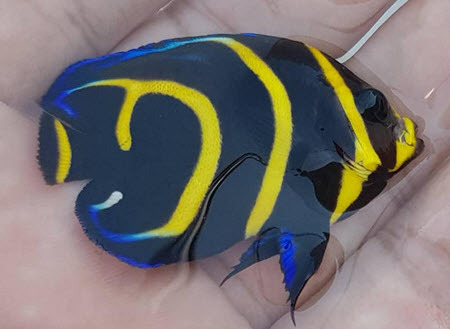 “My dream is to be able to breed Cortez angelfish like this specimen breed by Bali Aquarich. Bali Aquarich breeds a selection of angels, Clownfish and other species and is an inspiration to me,” says Henry. I was really into cichlids. I loved them but one day I was out catching fish by a rock pier on the Pacific coast and caught a juvenile Cortez angelfish. It was unlike anything I had ever seen before. The patterns, the color, it was incredible. From that day on I was utterly hooked on saltwater. I replaced my cichlids with saltwater fish and kept looking for other fish that could match the beauty of the Cortez angel. I also fell in love with seahorses. I have only recently been able to get a setup that allows me to keep seahorses successfully. What are the challenges of keeping a reef aquarium in Nicaragua? The challenges are the same regardless of whether you want to keep fresh or saltwater aquariums in this country. It is very hard to get your hands on the equipment you need. There are only a very low number of fish stores, and they have a minimal selection of equipment available. Almost everything that is available is designed for very small freshwater aquariums. There used to be a store in Managua that was run by a German immigrant. That store had a selection of marine equipment. They also sold marine livestock. That store did however recently close due to the civil unrest (2018). It is now, once again, almost impossible to get equipment. You have to ask friends to bring it from the USA or you have to build it yourself. The Youtube channel DIY king has been a big help to me. It has allowed me to learn how to build my equipment. His guide on how to build your own protein skimmers has been especially helpful. It has always been very hard to get them in Nicaragua. Another problem is that is very hard to find large aquariums. Anything over 40 gallon is very hard to find. It is also tough to find glass or acrylic thick enough to be able to build a larger aquarium. Hopefully, this will change in the future but it has not done so yet. What fish do you keep now? I keep a variety of marine angelfish and damsels. I also keep an aquarium with some small red snappers. I am trying to reduce the number of species I am keeping in the hope of being able to breed a few of the Damsels species and perhaps even the angels. I am trying to read everything I can find about breeding marine angelfish. I catch it myself or buy it directly from catchers. There have been several attempts made to start exporting saltwater fish from the country, but they have all failed. Usually for none business-related causes (drugs). This has led to a lot of trained but no longer employed catchers that can help me get species. Do you keep any freshwater fish right now? No. I am tempted to set up a tank for clown knife fish. A species that recently was imported for the first time. But I have not done so yet. It might be the clownfish that I just mentioned but more likely it is going to be an octopus tank. I always wanted to keep one but have never done so. Do not give up and read everything you can get your hands on. Watch Youtube videos. The more you learn, the better chance you have of being able to keep the species you want to keep. It might take a long time before you are able to do so but most dreams can be achieved over time.